Both of these medallions have embellished the covers of the Russian Orthodox Gospel books. The larger medallion is inscribed on top ‘Resurrection of Christ’ (enameled metal, brass); and the smaller one is inscribed on the right ‘John’ for ‘St. John the Baptist’ (enameled metal, brass, glass). The enamel on the ‘Resurrection of Christ’ medallion is overall in a very good condition except for a few small chips on the very bottom, just over the frame. The enamel on the ‘St. 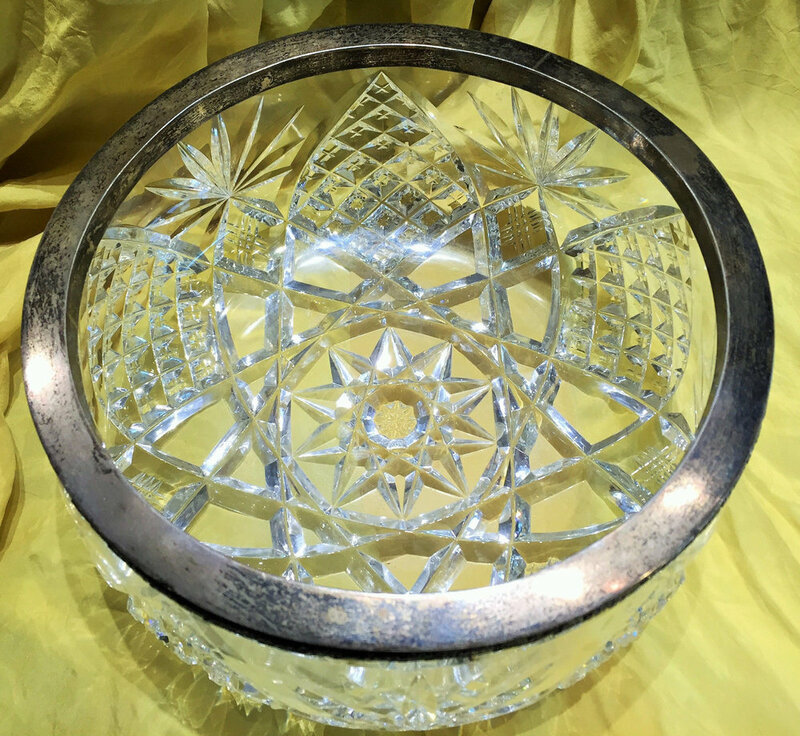 John the Baptist’ medallion is in excellent condition but one glass rhinestone is missing. Sold in a lot, ‘as is’. Signed with Cyrillic initials M.S. for Maria Semenova. Assay mark of Moscow, 1908-1917. Dimensions: 3 3/4" W x 2 3/8" D x 1 5/8" H.
Maria Semenova (active 1896-1917) was an important Russian silversmith and enameller. 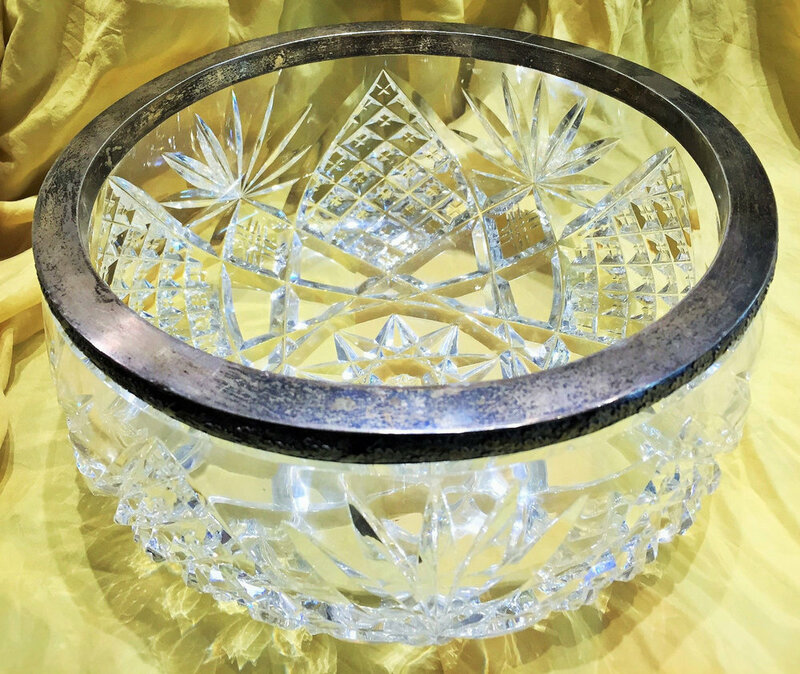 Daughter of a well-known silversmith Vasili Semenov, Maria took over the family business after his death. 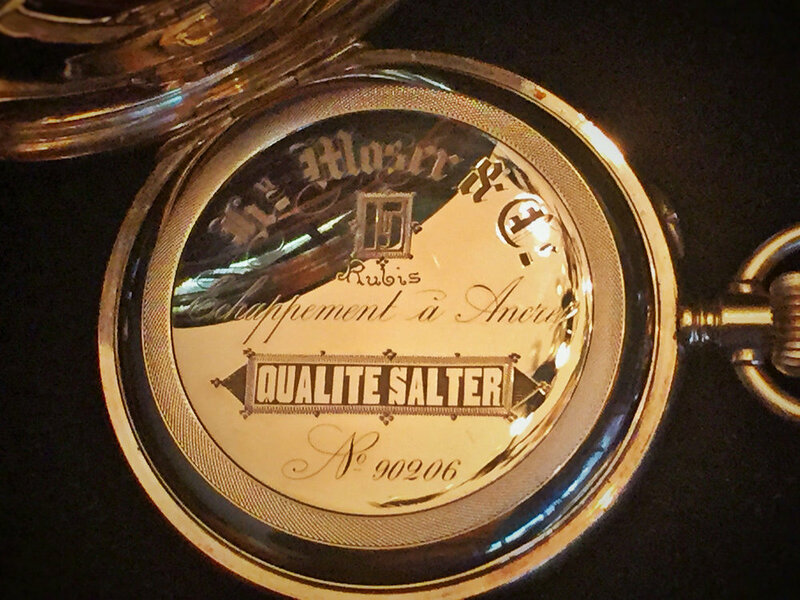 Under her supervision, the firm became famous for its high-quality enamel objects. Figural silver paper weight in form of a naturalistically cast male Black game, or Black grouse with its unique lyre-shaped tail, on the round nephrite base. 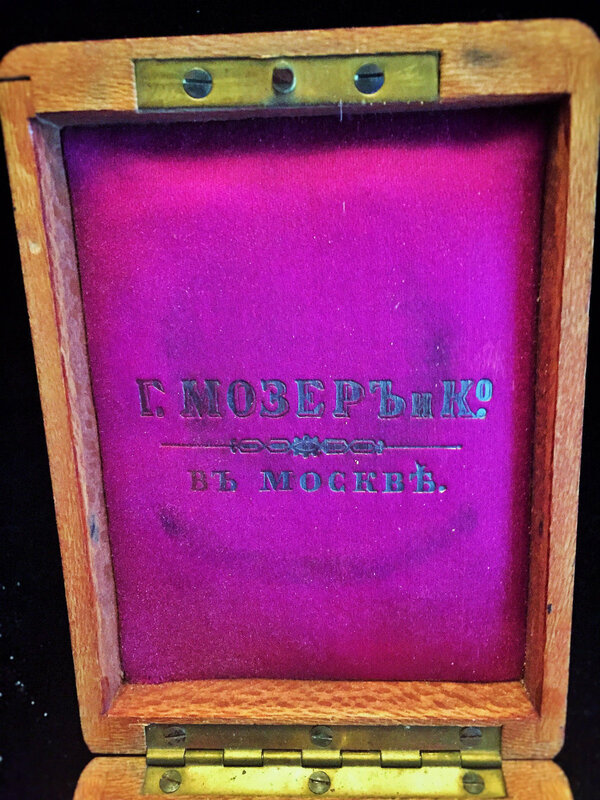 Marked in Cyrillic, the workmaster's initials "I.P", "Faberge" and "Kokoshnik" with 84 standard silver purity mark. Julius Rappoport (1851-1917) was born Isaac Ambramovich Rappoport in the Datnovskii Jewish community in Kovno, Lithuania. 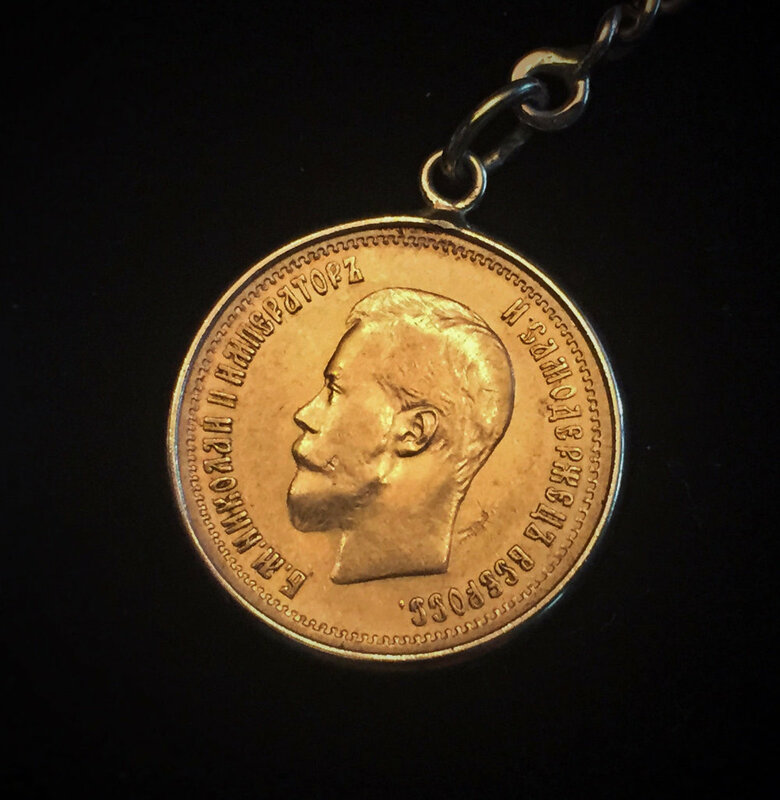 In 1880, he began apprenticing in Berlin under the silversmith Scheff, and by 1884 he became a master and returned to St. Petersburg where he became Fabergé head silversmith. His workshop contributed to a range of objects, from animal sculptures to large dinner services. In the early 1890s he converted to Lutheranism and changed his name to Julius. Following his retirement in the early 1900s he left the fully equipped workshop to his workmen which became the First St. Petersburg Silver Artel. Beyond these few facts we know little, but Rappoport’s material legacy compensates for his biographical obscurity. 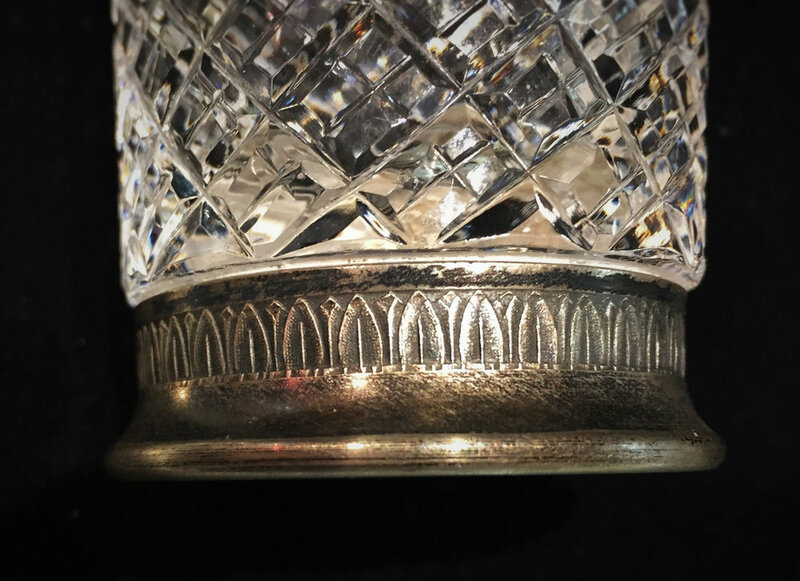 In fact, Rappoport’s silver is so revered that connoisseurs of Fabergé’s oeuvre often comment that his silver production was among the finest pieces produced by the Fabergé workshop. 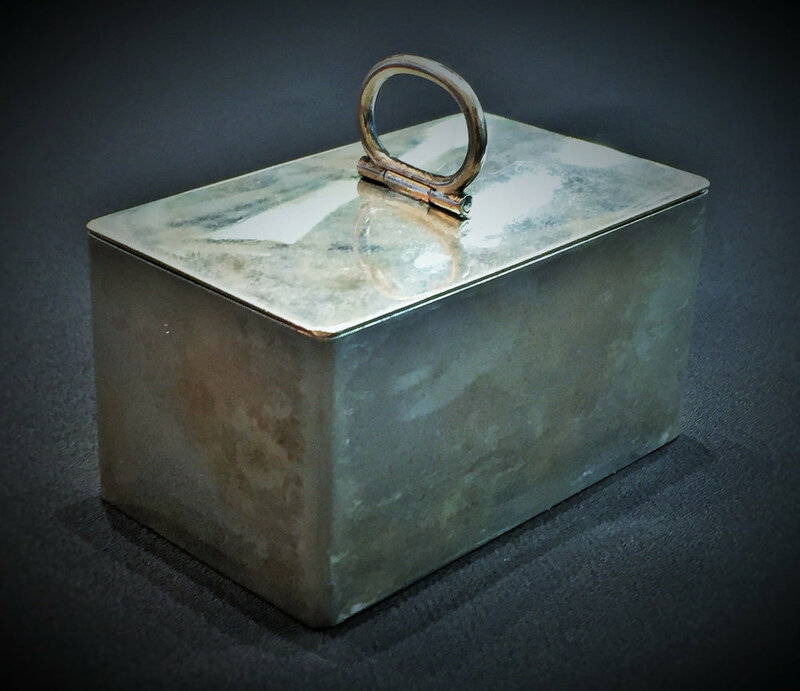 In all probability, this elegant desk accessory, perhaps as a "mémoire" of a hunting trophy, had once adorned the desk of a passionate hunter, and clearly not a poor man! Since ancient times, hunting played a major role in the life of the Romanov dynasty emperors and Russian nobility. Many autocrats of this dynasty were passionate hunters, but especially seriously addicted to hunting were three of them: the emperors, Alexander II, Alexander III and Nicholas II. Many simply believe that kings hunted only large animals - bears, elk, wild boar, deer and bison. This is certainly not the case. Russian tsars loved many types of hunting, including game birds and especially the hunting for black grouse, found in the dense forests of central Russia in great abundance. Hunting was the main type of "haute société" recreation and leisure activities. At the beginning of the XIX century the Imperial hunting grounds were transferred from St. Petersburg to Peterhof. Then later, in 1858 they were transferred once again - this time to Gatchina, where they were located during the reign of Emperor Nicholas II, from1894 to 1917. As for the personal involvement of the last Russian sovereign in the hunt, we read in his diaries for 1907: "3 September. Total killed: 5 grouse, 1 black grouse and 4 hare. I did not shoot. " Made in St. Petersburg ca. 1990, this beautiful hand-made Russian Orthodox silver and blue enamel pectoral cross on a chain exactly reproduces the classic model, remaining most popular and unchanged since the 18th century. 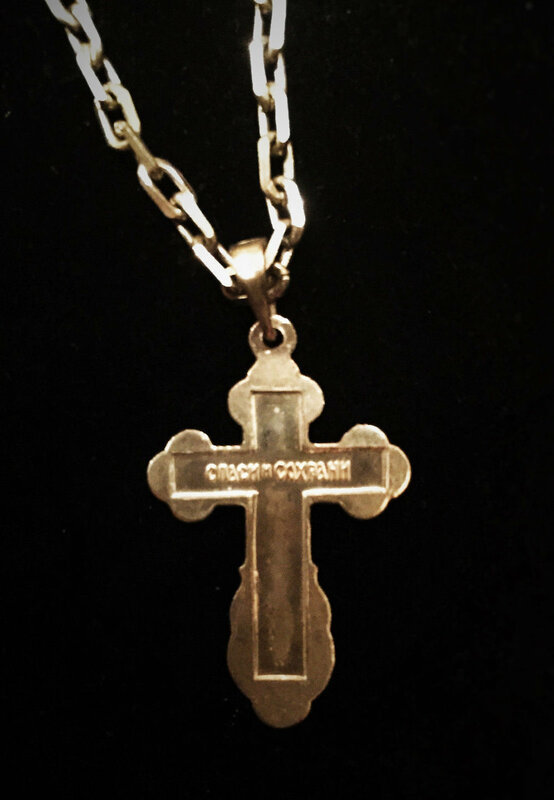 - 84° Russian Silver Standard - The Russian silver standard is based on the zolotnik, a word derived fromthe Slavonic word for gold. 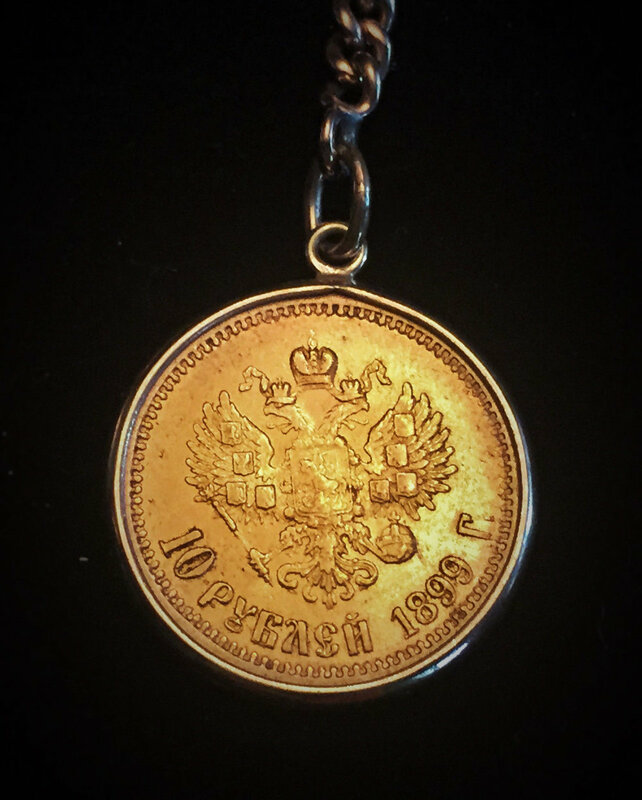 The zolotnik was originally a gold coin circulating in Kievan Rus in the late 11th century, and wasoriginally pegged to 1/96th of a Russian pound, which was later changed to 1/72nd of a Russian pound. One zolotnik is equal to 4,266 grams. - City hallmark of St. Petersburg - Two crossed anchors and a scepter. - Assay master mark - In Cyrillic: "EB" (ЭБ) for Eduard Fyodorovich Brandenburg (Эдуард Федорович Бранденбург), and dated: 1856. 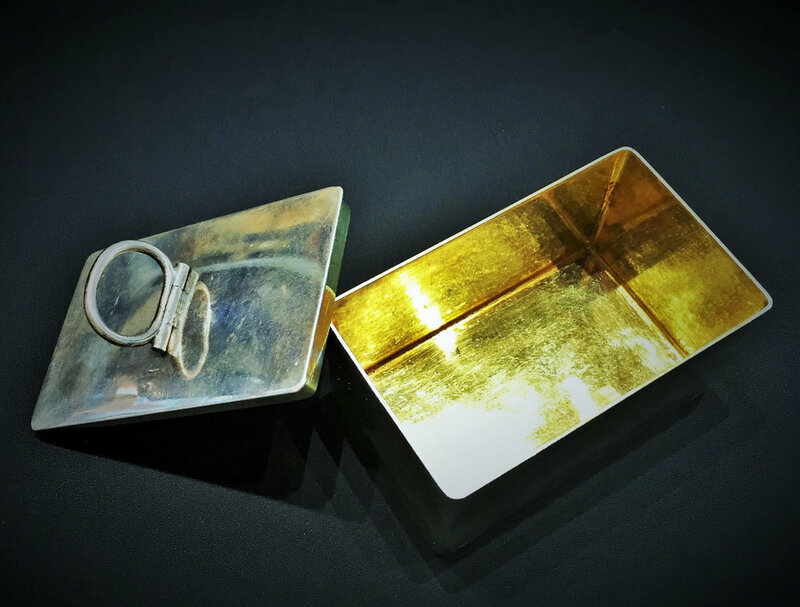 A contemporary of Carl Fabergé, Pavel Sazikov is a highly important and respected 19th century Russian silversmith. The firm of Sazikov was founded as a workshop in Moscow by Pavel Sazikov in 1793. Though it remained family run, the business quickly expanded. After Pavel’s passing, his son Ignatti (1796-1868) succeeded him in running the business. Ignatti expanded the firm to Saint Petersburg in 1842. Around that time, Sazikov was appointed the title of court supplier, and the firm was given the right to incorporate the imperial double eagle into the Sazikov trademark. After Ignatti’s passing in 1868, his three son continued to run the business in Saint Petersburg, until that branch was closed in 1877. The Moscow branch continued for another ten years before it was taken over by another firm. Presented here is a wonderful cut crystal-and-silver set, consisting of a tall pitcher with the gold plated inner part of the neck and cover and twelve matching glasses with the silver rim featuring repeating acanthus leaf design.All silver parts of the set are hallmarked with a barrel shaped cartouche with the image of a sickle & hammer inside a 5-pointed star, followed by the number 875, and capital letter M in front of the star image is for Moscow assay inspection. Next to them, there is another stamped hallmark "3MO" (Mosremchas factory, Moscow). 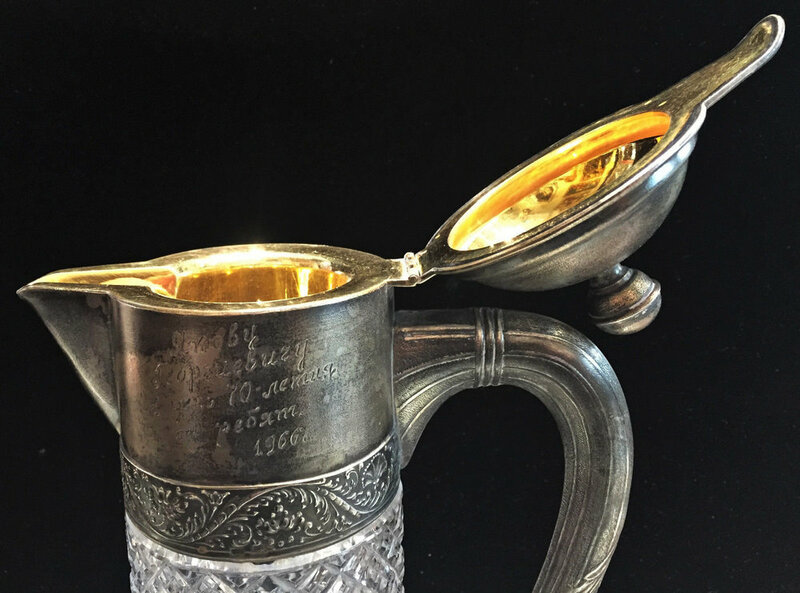 Judging by these hallmarks, this set was made in Moscow between 1960 and 1965.There is also an engraved inscription in Russian on the outer part of the pitcher's neck: "To Yakov Georgievich on his seventieth birthday from the guys, 1966"
A pair of silver-mounted Orsk Jasper photograph frames from the workshops of Peter Karl Fabergé, made between 1908 and 1917 in the Rococo taste, with oval apertures, surrounded by laurel leaf wreaths and the outside border with bead decoration; topped with ribbon and bow surmount. 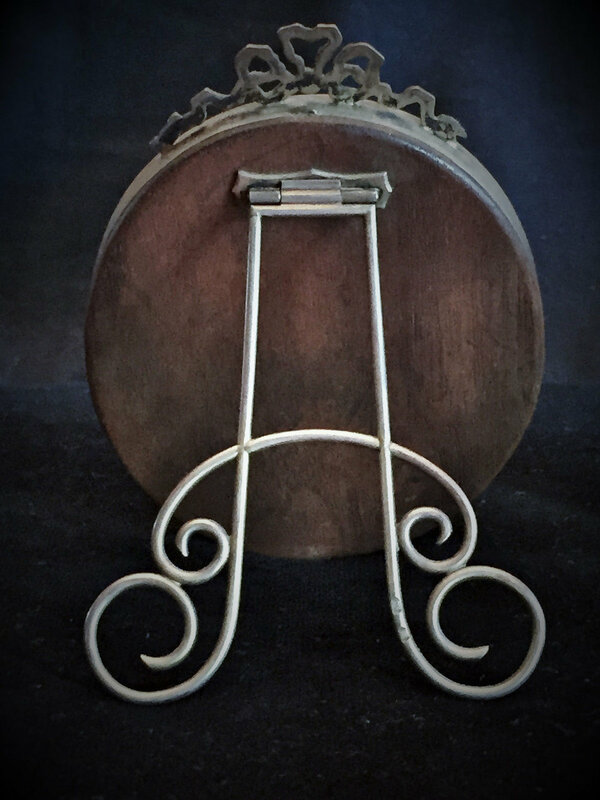 The wooden backs with scroll design easels. 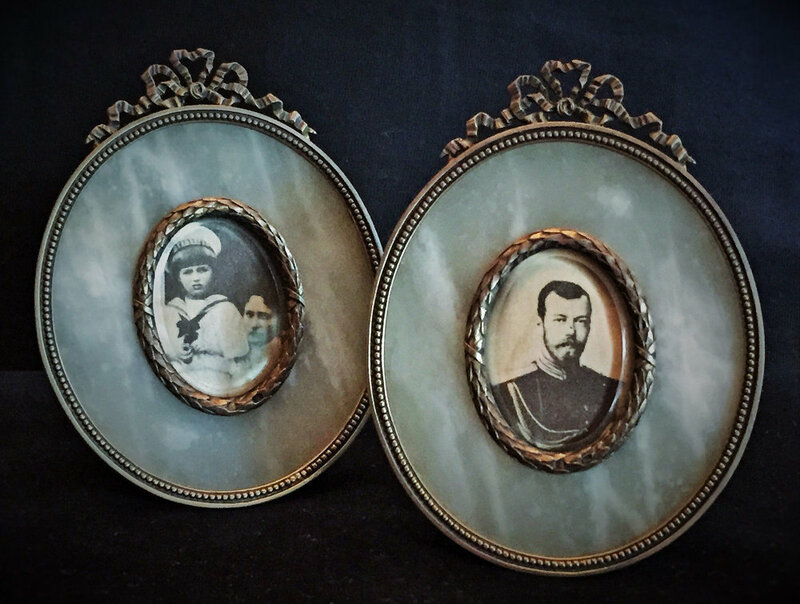 Both frames are hallmarked on the bottomn in Cyrillic "Fabergé", "Kokoshnik" (facing right) with the 84° "zolotiniks" standard mark in an oval field and initials "KF". 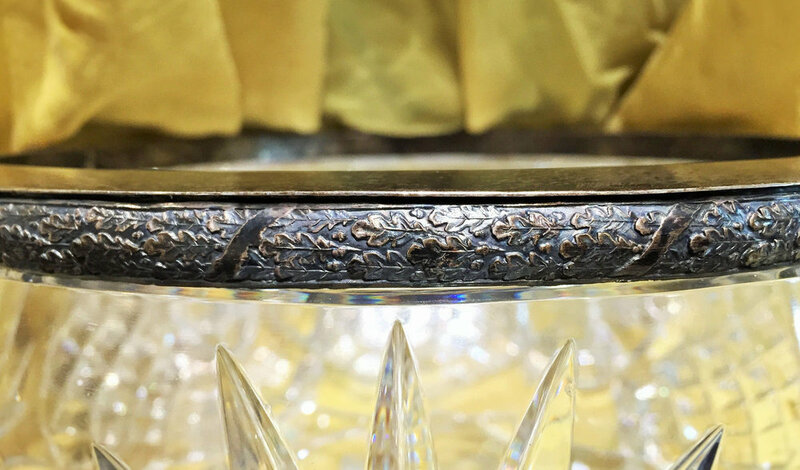 Every applied part (the laurel wreaths surrounding the apertures, and the easels) is hallmarked with "Kokoshnik" and initials "KF". Excellent antique condition with some minor signs of age or wear. Both frames have preserved their original beveled glass. Please observe photos carefully, as they are a significant part of the description. Any potential defect shown in the photos, but not mentioned in the description will be considered as described. 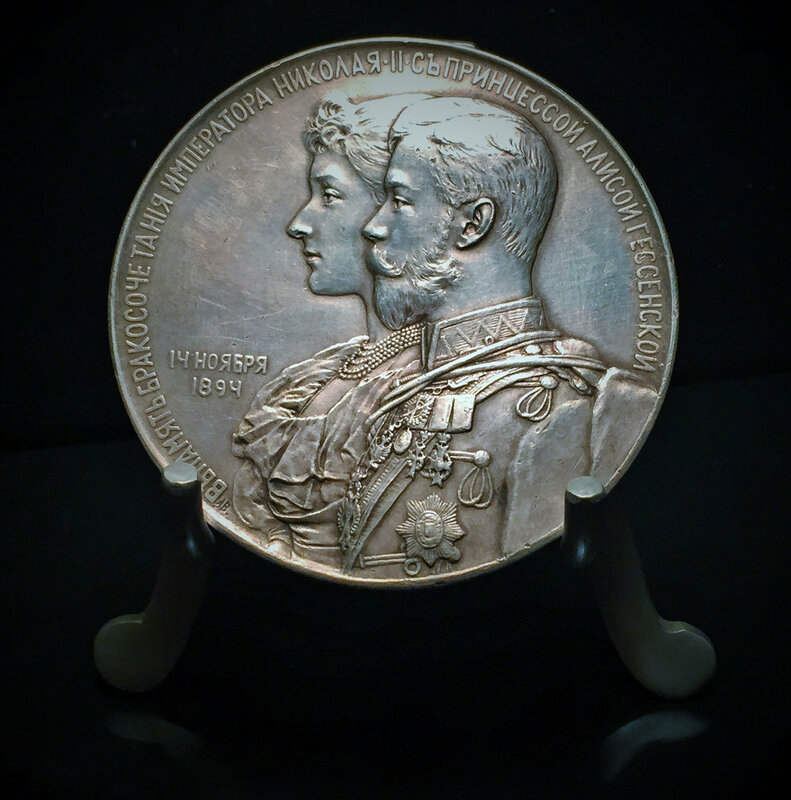 We are proud to present a very rare and important Imperial Russian silver medal, commemorating the wedding of Emperor Nicholas II of Russia and Alexandra Feodorovna (Princess Alice "Alix" of Hesse und Bei Rhein). Launched in extremely limited quantities, this medal was a royal gift to commemorate this historic event, reserved exclusively for guests in attendance at the royal wedding ceremony. The bas-relief compositions on both sides of this outstanding commemorative medal were made from the drawings and models of the unsurpassed master, Anton Feodorovich Vasyutinsky (1858 - 1935), a professor of Russian Imperial Academy of Arts in Saint Petersburg, a famous painter and prominent designer of medals and coins in the Russian Empire, and later in Soviet Union. 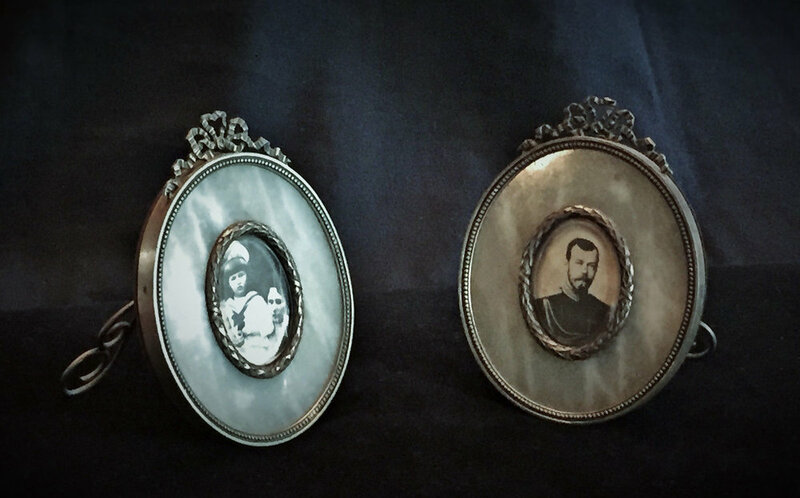 The conjoined busts of Nicholas II and Alexandra Feodorovna (Princess Alice "Alix" of Hesse) depicts the couple at their last date, as bride and groom, before the wedding. The inscription, surrounding the double-image of the couple by the perimeter reads: "IN MEMORY OF THE WEDDING OF EMPEROR NICHOLAS II AND PRINCESS ALICE OF HESSE, 14 NOVEMBER 1894". The reverse side of the medal shows a royally magnificent wedding scene in the Grand Church of the Winter Palace, fully coinciding with the historical events depicted in it. Invitations had been sent out, along with a dress code: Russian gentlemen were to wear full regimental dress, bureaucrats were to wear the appropriate uniforms as stipulated in Peter the Great's Great Table of Ranks; Russian ladies were to come in full court dress, foreign women in evening gowns, with full jewels and awards. The service was presided over by Father Ivan Yanishev, the private imperial confessor; along with various archbishop, bishops, archimandrites and court priests. Among those present can be seen Nicholas's mother, the Dowager Empress Maria Feodorovna, as well as his best men - Grand Dukes Michael, Cyril Vladimirovich, Sergei Mikhailovich and Prince George of Greece. In the center of the bas-relief composition, we can see the royal couple in all their autocratic splendor: Alexandra, dressed in her wedding gown and imperial mantle. Her Honiton lace veil had been designed by her maternal grandfather Prince Albert and had been worn at the weddings of her mother, Princess Alice (who died in 1878 when Alexandra was six) and her sisters. She also wore the traditional Romanov nuptial crown, a 475 carat necklace and matching earrings that had belonged to Catherine the Great. Across her body, she wore the star and sash of the Order of St. Andrei. Next to his new wife-to-be is Nicholas II, Emperor of Russia vested in his full Hussar's uniform, complete with his medals and the sash of the Order of Hesse und Bei Rhein. 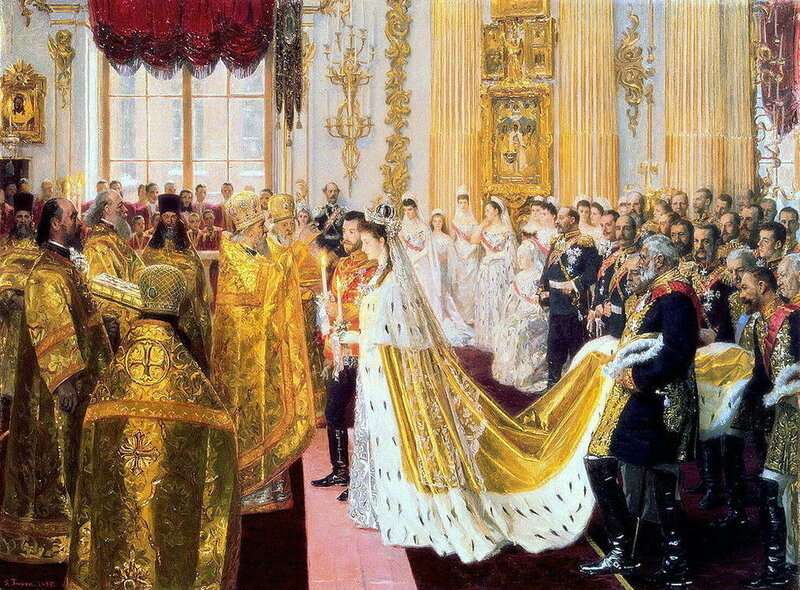 After blessing them, Father Ivan Yanishev announced the betrothal of Nicholas to Alexandra to the congregation, and then handed them their rings. 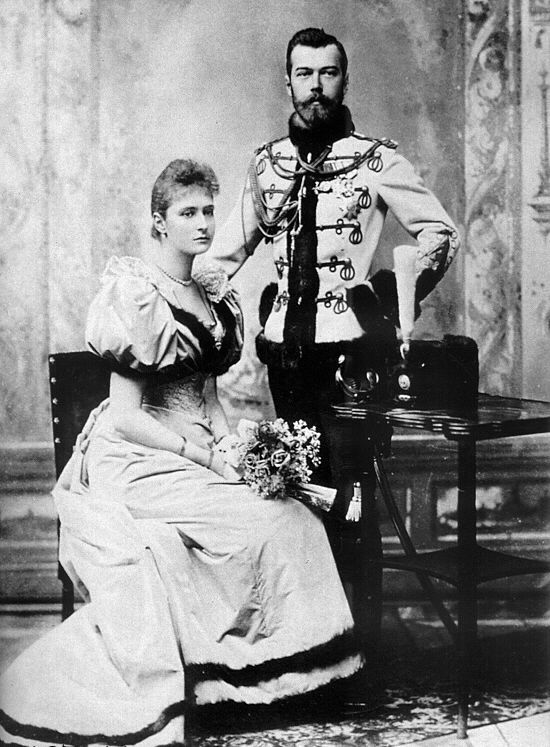 Upon exchanging them three times, Nicholas and Alexandra knelt and exchanged formal wedding vows, nuptial crowns above their heads. Then, they knelt and kissed a gold cross, and following a final prayer, Nicholas and Alexandra were pronounced man and wife, at which point the church bells across St. Petersburg rung, and guns were fired from the Peter and Paul Fortress. 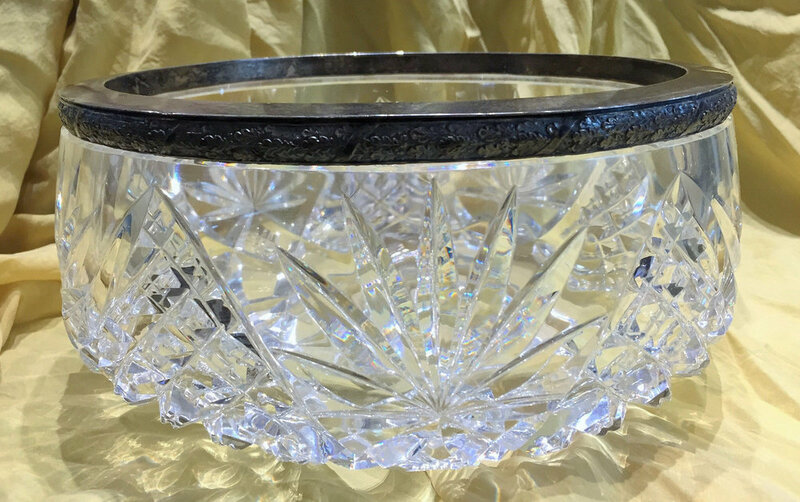 Presented here is a Vintage Russian Classic - cut crystal and serving bowl of unusually large dimensions, with a silver rim, featuring repeating oak leaf design. 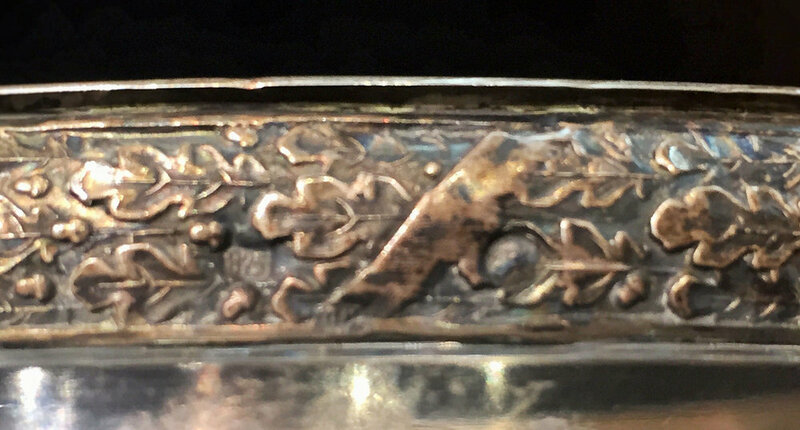 It is hallmarked with "875" and a cartouche with the worker's head facing right, holding a hummer over his shoulder. 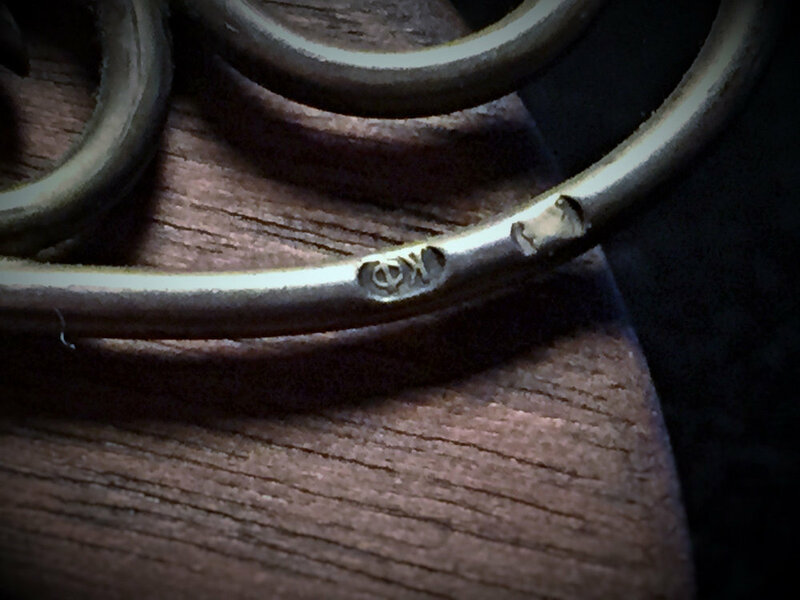 Judging by these hallmarks, the bowl was produced in Moscow, ca. 1945.